Up to 10k* worth of funded support available to East Midlands Companies in the Food & Drink Manufacturing sector or Companies in their supply chain. Funding is available on a match funded basis excluding VAT. Eligible projects include innovation in products, processes and services (innovation can be new the Company not necessarily new to the marketplace). Deadline for applications is end November 2012. Applications will go to panel for a decision first week in December 2012. Full £20,000 projects will automatically be put forward for a further fully funded £5,000 worth of support if they qualify. Interested? I recently chatted with local reporter Tom Pegden to discuss the state of play in the local business economy as news of a high profile media success had made its way along the grapevine to Leicester Mercury towers – the launch of Leicester based luxury hand made leather satchel brand, Zatchels! Zatchels, the brainchild of local businessmen Dean Clarke and Brian Brady of Charter Street manufacturer Leicester Remedial and Sewing Ltd was launched to the world with its satchels, hand made here in Leicester, on their beautifully designed e-commerce website on 20th April 2011. This is one of the most comprehensive product/brand launches we’ve ever undertaken for a client and we’re delighted about the reaction so far. The satchel is the ‘must have’ style accessory for 2011 and Zatchels has launched a truly iconic British collection of leather satchel style bags that have caused a major stir since it was discretely introduced to fashion observers and stylists during this spring’s London Fashion Week. It was essentially a UK launch but already Zatchels are getting interest and media coverage from overseas, so we’re delighted for our client. 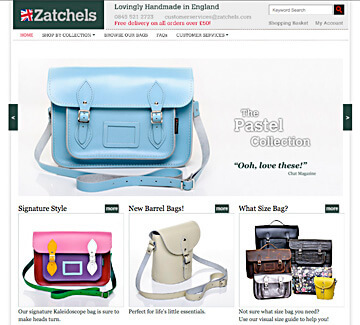 Since the Zatchels.com website went live three weeks ago it has had more than 6,600 visitors/hits, with orders coming in from the UK, USA, Australia and France as well as from UK based retailers who want to offer Zatchels satchels to their customers on the high street. The new website features 71 different bags, with high quality creative studio shot photographs taken by Mulberry Square account manager and Leicester Photographer Ian Bursill, who has gained world wide acclaim for his photojournalistic style of photography. We were involved right from the early stages and worked with our client to develop a logo and identity for the brand that was really strong and represented all of the key values and strengths of the product; and this in turn led to the introduction of the branding to the product itself with the stitching in of the distinctive woven label which coupled with its fantastic designs, materials and finishes sets Zatchels leather satchels apart from competitors in their market. As well as designing the Zatchels brand identity and website, we have also been involved in leading and managing the launch campaign which benefitted massively from PR and media relations being added to the usual marketing mix. This involved product placements with magazines and newspapers such as Bliss, Heat and the Daily Express, gifting to members of the band McFly coupled with a social media campaign using Twitter, Facebook and blogging. Our marketing services business based on Loughborough Road in Mountsorrel, Leicestershire faced a tough time in the height of the recession in the later part of 2009 but has really bucked the trend over the past 18 months with a full order book keeping our six fantastic staff very busy indeed. We will build on our historic turnover of £300,000-£320,000 p.a. this year as we have really focused and tried to get across our message that we cover all aspects of the marketing mix and therefore can really make a difference to our clients, some of which have been using our marketing services knowledge and experience for the past 18 years. As a result of our networking efforts we have been working on the launch of another new brand for a £20 million turnover Leicester business, with the launch of this planned for later this month. Rather than being fashion with the emphasis on consumer marketing this new brand will be very much B2B and will feature another eCommerce website designed and built on the Magento platform. We seriously have seen an upturn in the local economy, especially from manufacturers who have ridden out the recession and are now investing to take advantage of a better economic climate to come. 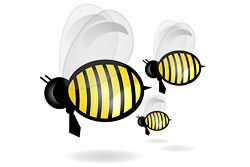 Are we aiming to win more big clients? You bet we are! Where are the plain language police when you need them? Surely they have been tipped off on this one before? We are in the process of creating an e-commerce website for a client who is going to be retailing really low value items, under £5 per transaction. The process is going well and the launch date will be in the middle of May. The Finance Director of this new business worked for a major high street bank for 20 years – she is no shmuck when it comes to banking, having gone from the tills to a board level consultant in her career. One of her tasks was to consult the Merchant Account and Payment Gateway Providers in the market, evaluate the services available and analyse the pricing structure in relation to the predicted Year 1. turnover and average transactional value. The first port of call was the online information and, as we bank with NatWest, Streamline had the first opportunity. The information seemed OKish but the path lead to one individual that covers their patch. That individual was a sales person and was very busy. Eventually the Finance Director managed to get some advice and was given the standard rates (why they were not available to download from their website I haven’t the foggiest). Next a personal telephone consultation with Barclaycard, followed by a recommendation of the wrong product, followed by an application, followed by a stalker who called and texted at every turn. Through my membership of the Federation of Small Businesses I learnt that the Federation had negotiated a deal with Streamline for preferential rates on their Merchant Account & Payment Gateway products in association with WorldPay. The Streamline lady was permanently on answerphone so I called her support team in Harrogate; “You’ll have to speak to Sue” was their reply. Eventually I spoke to Sue who confirmed that as our client was also a member of the Federation, she could have those rates. I asked her about whether we had to implement 3D secure as part of the payment process, to which her reply was uninspiring to say the least. Next it was on to Barclaycard, very nice people and yes they knew their stuff when it came to security. The problem was the language they used on their typed up and posted estimate; what the heck is ePDQ-CPI? This required a visit to their website over the weekend – no wonder customers get stiffed on bank charges. I know what I’m talking about on this subject and even I was bamboozled by it all. Eventually I gathered that for one reason or another ePDQ-CPI was clearly the wrong product, partly as customers would be sent to a separate web page to pay. Who in their right mind would want to start up a serious retailing business and, just as the customer is about to hand over the cash, the shop keeper sends them to the nearest bank to hand it over… madness! So another call to the nice people at Barlaycard yesterday – luckily forearmed with an inkling that I knew what was needed. Very early on they wanted to throw in the towel, ‘we won’t be able to compete with a deal with an industry federation’ they said, but no, hold on, I say, your ePDQ-MPI product being a combined Merchant Account and Payment Gateway has a chance This is a low value transaction that we are talking about, won’t the majority of customers just put it through on Debit Card? ‘I would” was the reply. Then this looks like the product for the job I said – and surprisingly it is! Having also compared it to PayPal’s all in one service and factored in SagePay’s offering, the clear winner is Barclaycards’ ePDQ-MPI. I was left exhausted by the experience, but with our reputation with our client elevated by hacking through the smoke and mirrors of branding and the deliberate jargon put out to make customers stick with who they know rather than identify who is the best for the job.